Back in October 2008, I blogged about the change of ownership of 'The Wetherby Bookshop', one of my favourite local haunts. This time, I have to report on its impending demise, something that we discovered when we went out shopping in Wetherby on Saturday afternoon. In my previous entry, I mentioned that my initial impressions were that it was a little chaotic after the transition, and that I hoped that things would settle down. In my experience, this wasn't the case. When Jill asked why the shop was closing, she was given the answer that "The people of Wetherby haven't supported us – only four people visit per day. They'll be sorry when we're gone." Although I'm really sad to see the shop go, I think that there are a number of factors in play here that have made the failure of the business inevitable. 1) The arrival of a competitor. 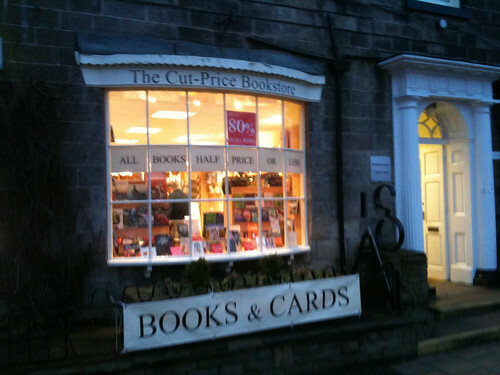 Last year, another local bookshop "The Cut Price Bookstore” opened in premises in the centre of town. 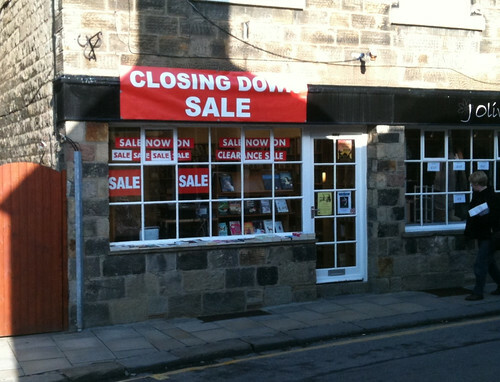 This was an additional branch of a shop based in Helmsley. It sells a large and varied amount of stock, most below RRP (as I suspect that some of it is clearance material) but it will also order books in. So, direct competition. There was no discernible change in how 'The Wetherby Bookshop' operated in response to this. Update: I’d based by comment on ordering books on an overheard conversation. I asked to be sure, and found that you could order books from the other stores (if they had them), but otherwise you could only request that their buyer keeps an eye out for something as they mainly buy remainders. There’s an obvious business opportunity here for the new shop. I’d also observe that the new bookshop is right beside Costa Coffee and the bus station, not down a back street, so it has a much higher footfall. 2) The recession and Amazon. Amazon made a significant change to their shipping pricing over the last year, when they dropped the threshold for "super-saver" free delivery to £5. This changed the whole economics of the local bookshop, as prior to this it was cheaper – and faster – to order from the 'Friendly Local Book Shop' (FLBS) rather than get it from Amazon. Plus it gave me a warm, glowing feeling of supporting my local community. I'm guessing that this will have hurt, a lot, if people are looking to cut back on expenses yet retain their standard of living. I also suspect that the amount of impulse buys will have reduced as people’s budgets have tightened. Both of the above are clear changes to the business environment, but this was a business with a huge amount of goodwill and what seemed to be a lot of traffic through the doors. Why would that collapse? Well, here are my thoughts. Penny, the previous owner, was a classic small market town shop owner. She knew her clients, often by name. She searched out books, and if they were out of print would give pointers or suggestions of good places to get them. She used a laptop and a monthly CD ROM book catalogue to see what was in print, and more detailed searches at home if this yielded no success. When the stock came in, she knew precisely where it was and could lay her hands on it immediately. This all changed; the new shop was hooked up to the internet and could place orders online (rather than through a phone call) to the publishers. The new owner was on record in the local newspaper as saying that this was one of the improvements she was bringing to modernise the shop. The tone of the article was that the previous owner was fuddy-duddy and the place needed a serious change to improve it. As a regular customer, I felt pretty outraged on the tone of the article. My experience suggested completely the opposite to the 'improvements'. On at least two occasions I stood there for 5 or more minutes (in a shop the size of our front room) whilst the owner hunted for a book I had ordered and she had called me to say it was ready to collect. At no point was there any suggestion of an improvement to how things used to be. At the same time, the selection of books seemed to get worse. I'd usually – at least 2 out of 3 times – end up with an impulse buy when I visited the shop, as Penny always had a good selection of interesting titles. The titles may have still been there, but they weren't obvious to the casual browser. Bookshops have that special kind of feel. You know the one I mean? Kind of like a library, a little reverential but with an enthusiasm for literature and stories. They're often at their best when they aren't clinical and pristine. The Wetherby Bookshop definitely needed a little sprucing up, but the changes since October 2008 made it a lot less welcoming. The central book display was halved in height; it probably held the same amount of stock, but it was less accessible and the place looked like it had less books. An armchair appeared; great in somewhere like Waterstones – or the now defunct Borders – but not so good in a room the size of most people's lounge. This in itself was not terminal, but the change in attitude was. The whole vibe of the shop went from welcoming classic little bookshop, to something quite different. I no longer felt welcome in there. One of the really obvious things was the number of times that I came in and the owner and friends were there drinking wine, and generally having a great time. You got this whole feeling that you were intruding and an inconvenience. And it was something that I disliked. The 'F' had gone from the FLBS. Looking at myself, although I've bought less from the bookshop in the last 18 months, I don't actually feel guilty about it, as it coincided with a general crash in my reading rates. Usually, I manage around 80 to 100 books a year, but 2009 saw me read just over 40 due to other demands on my life at work etc. I doubt my level of purchases will have made the difference between survival and failure. So, I am sad that 'The Wetherby Bookshop' is closing, but I think that the comment about the attitude of the people of Wetherby is myopic; it fails to look at the conditions of trade and the reasons why so much 'goodwill' would be burned away so quickly. It's so much easier to blame it on the people of Wetherby and to forget that no-one owes you a living. The customer remains king. Goodbye, old friend; you actually died in October 2008, although we didn't know it then.